You know what might slow down the adoption of UAVs for mundane, civilian tasks? 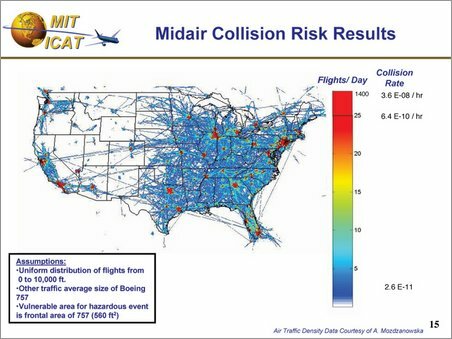 The fact that their accident rate is 100 times higher than that of manned aircraft. I found an analysis of UAV risk, “Safety Considerations for Operation of Small Unmanned Aerial Vehicles in Civil Airspace”. 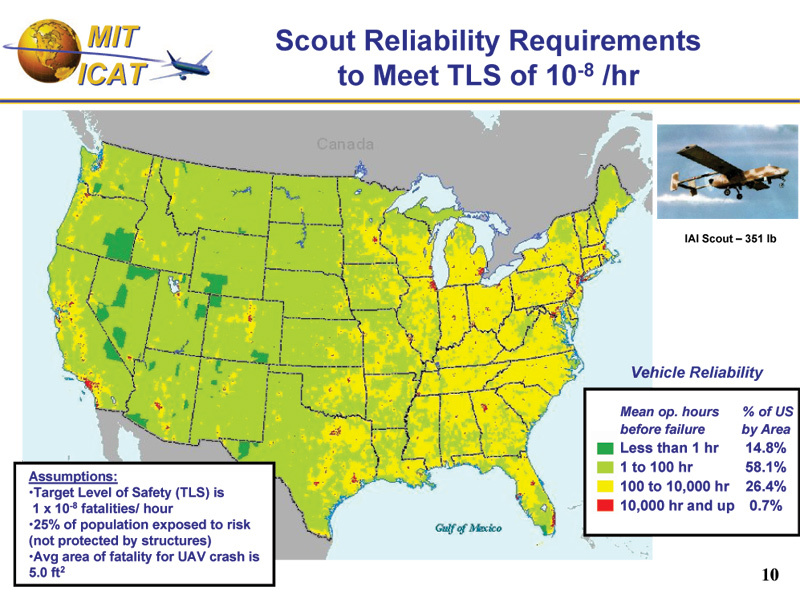 The map below shows how reliable a 26,000 lb. 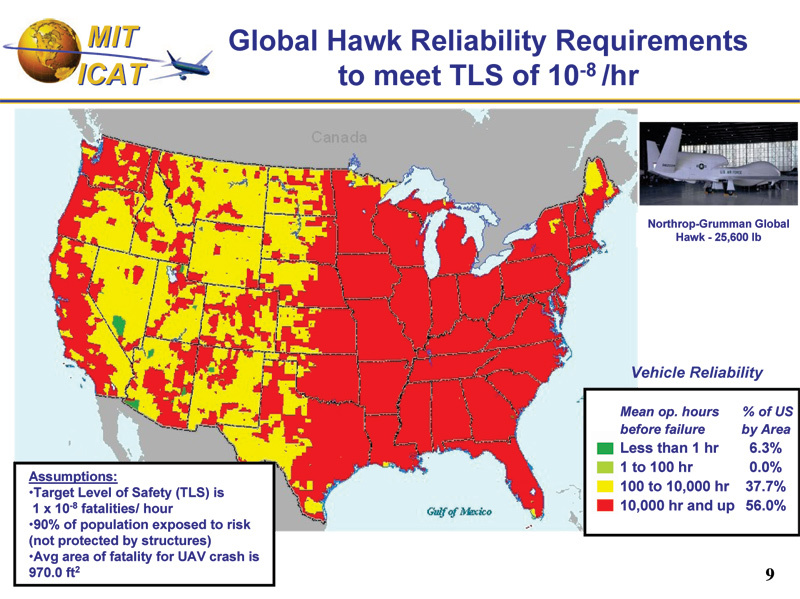 Global Hawk UAV would have to be to achieve a “Target Level of Safety” (TLS) of one event involving a fatal injury to people on the ground per 100,000,000 hours of operation. Regions with higher population densities require the UAV to be more reliable. 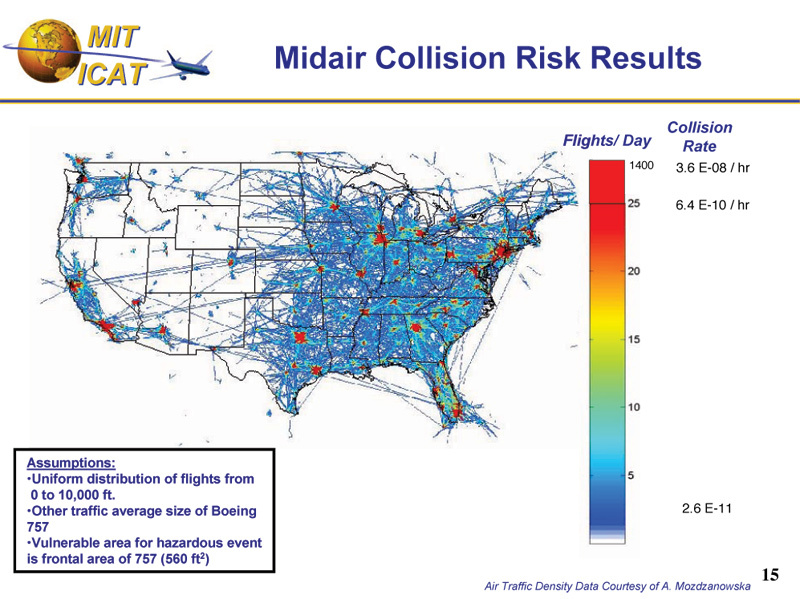 Of course, if you fly them over foreign countries, the risk of American fatalities plummets. Those damn Jaffas always shoot at them! Where do you get that data for Scout? I don't think it is that reliable. 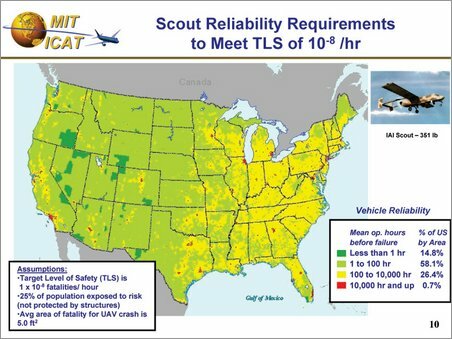 I think the reason that the map for Scout reliability looks so good is because "reliability" combines two things: the chance that the vehicle will fail and crash, and the probability that a crash will injure someone. 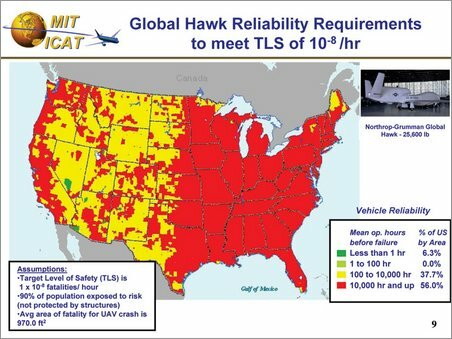 Because it's so small and (relatively) light, it's less likely than the Global Hawk to come in contact with someone if it crashes. Being hit straight on by a 351 lb. vehicle isn't going to be fun, but I'll take my chanes with it over the 13 ton Global Hawk. That thing could take out a couple houses. Okay, none of you work on any kind of uav program, and have no idea of what you are talking about. You think because you have a couple numbers from god knows where and a couple charts that you know everything about the safety of uavs. Arm chair scientists. I'll bet none of you refrain from driving anywhere because there are large MULTI-TON semi trucks driving around that could smash you like a bug, right? Plus, whoever is circulating the ridiculous manned to unmanned crash ratios must also take in mind that manned flight is over 100 years old and has millions more flight hours than all uav programs combined, so take that into account before you go proclaiming uavs as "devilcraft."